If you look at The Experiment and its creator, Dr. Finkelstein, you will find many parallels to the infamous tale of Dr. Frankenstein and Dr. Frankenstein's Creation. The only difference, however, is that The Experiment is a body of mismatched machine parts, still resulting in a ghastly appearance which is as ghoulish as that of Dr. Frankenstein's Creation. The Experiment is initially intended to be a playmate for the three naughty children Lock, Shock and Barrel in an attempt to keep their wrongdoing at bay; however, when they start throwing its parts around, Dr. Finkelstein - its creator - calls off the project. He seemingly takes it up once again later on and when he isn't looking, it attacks him as a way of ensuring a clear getaway. 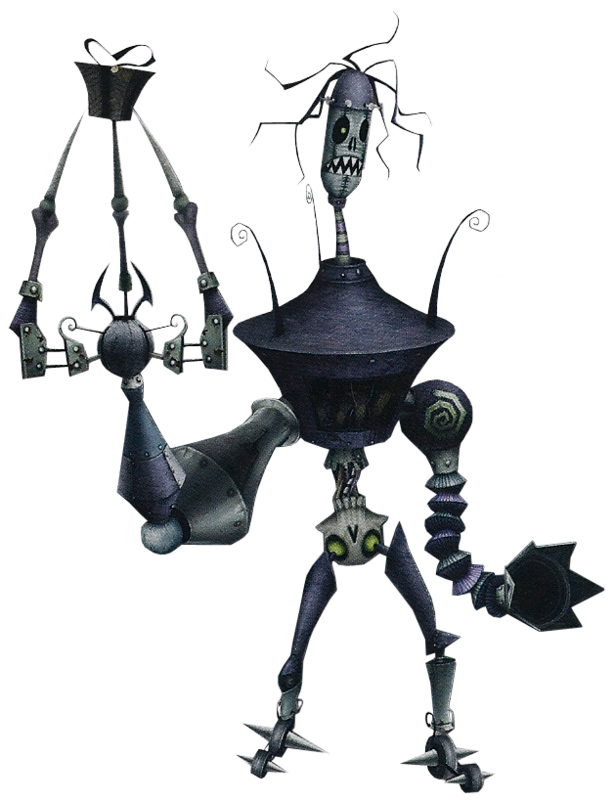 It steals presents from Christmas Town and is later detained by Jack and Sora and friends once it falls into their trap. After they do battle with it it is sadly killed, at which point it is ironically discovered that all The Experiment was looking for was a heart.